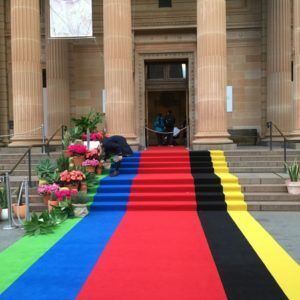 Whether it’s for weddings, corporate functions, product launches, awards nights or large exhibitions, AU Carpet is flexible to your event needs , we offer vibrant & soft red and white event carpets on hire in Sydney & Melbourne. . We have the experience to ensure your carpet is laid professionally to make an impact. You could enhance your event by adding a carpet circle or circles to highlight the speaker, special guest, showroom area, or product. We can cater for small private events like home parties, all the way up to large sporting events, nothing is too big! 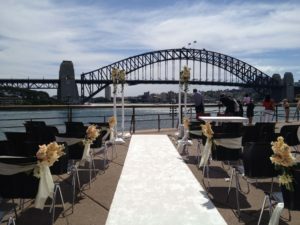 If you would like to buy a red carpet in Sydney or Melbourne for your next event, contact us here at AU Carpet. We specialise in hiring carpets for your special event, whether it be for a wedding reception, corporate function, opening night, launch party or themed event. We have many satisfied customers and pride ourselves on a fast and efficient service, attention to detail, customer service and value for money. Adding our carpets to your next special occasion will create the perfect atmosphere for your guests. Our carpeting is soft and vibrant, which looks great in photos (simply look at our gallery to see for yourself) and will provide the perfect entrance to your venue. Best of all, we not only buy and hire red carpet in Sydney or Melbourne, we will happily supply and install it for our customers to allow you to enjoy a stress-free event. Not sure if red is the right colour? That's ok, we also have black and white plush carpets available for you to hire at an affordable price. If you have an event coming up in the near future your guests are sure to appreciate the VIP treatment. Don't miss out, book early to avoid disappointment. 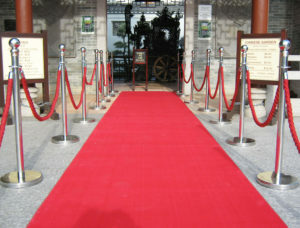 Whatever your red carpet hire requirement, AU Carpet is the one stop supplier you need to call. If you have any questions about our services or would like to receive a quote, please contact us today. Along with wide range of carpets, we also stock: Bollards & Ropes, Media walls and Artificial Turfs. If you are planning an event in Sydney or Melbourne, Contact us on 03 9042 1800 for Melbourne & 02 8411 1234 for Sydney, to discuss your requirements. Create the perfect entrance to your event with AU Carpet's white carpet hire in Sydney and Melbourne. White carpets are great for a range of occasions and are particularly popular for weddings. When it comes to your wedding we know you want everything to be perfect, which is why we only supply the highest quality products. Our carpeting solutions are perfect for lining a venue or for creating a beautiful aisle for the bride to walk down. Best of all, it creates a gorgeous atmosphere that won't cost you a fortune. Of course, our white carpet hire is used for heaps of other occasions in Sydney and Melbourne including charity events, openings, themed parties, products launches and much more. Whether you need a small section or a large quantity, we can successfully cater to your needs and supply a high quality product at an affordable price. When you take advantage of our services, you get the benefit of a friendly team who will not only provide amazing customer service, but will go beyond what's expected to ensure your event is one you'll remember. We'll ensure you get your carpet when you need it and will complete the installation for you. Let the team here at AU carpet transform your party space and hire one of the plush, luxurious carpets we have available. If you prefer coloured carpeting, take a look at our colours featured on the sample page. Turn an average party set up into an amazing one with our event carpet hire in Sydney and Melbourne. We supply, install and hire carpet for a range of parties and corporate events. No matter where you are or what you're celebrating, our services can ensure your venue is prepared and ready for guests. With more than 20 colours available and prices that are sure to fit comfortably into your budget, setting up the perfect event is now easier than ever! Whether you need a product launch, themed party, private function, wedding or exhibition (expo) carpet in Sydney or Melbourne, our team can supply you with the perfect solution. We pride ourselves on our excellent customer service that focusses on attention to detail, low pricing and quick delivery. We'll ensure your carpets are installed and ready to be walked on long before the commencement of your party meaning you can sit back and relax. Take a look at our photo gallery to see how amazing a carpet could look at your next function. You can stick to the traditional black, white or red options or venture out and hire a vibrant colour that really stands out – the choice is yours. For further info on our event carpet hire for Sydney and Melbourne events, or to make a booking on a particular date, please call us and we will happily discuss your carpeting needs with you. You can also request a quote from our team via email or phone.